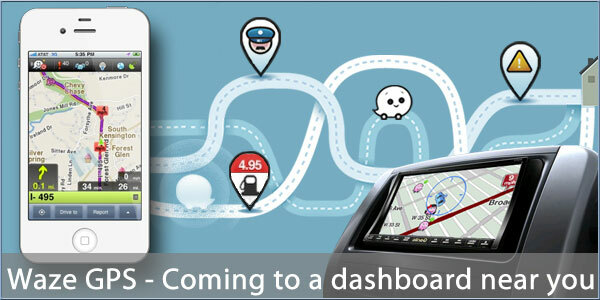 Waze, the popular social GPS platform is coming to car dashboards later this year. Waze CEO Noam Bardin wouldn't be drawn on which car makers had signed deals but it's an interesting move for the company which has enjoyed huge success on the Android and iOS smartphone platforms. Waze is built on social integration. Its map data has been compiled by the users and updates and corrections are collated via the app. Users can report traffic jams and other incidents plus, more recently, fuel prices as well as having access to the usual navigation features. The move into the car dashboard will require connectivity as Waze is an off-board solution with all maps and other data coming from the Waze servers but it is the logical next step for the service. Just looked at their website. Judging by the map they let you see, it looks like they're US-only at the moment. So much for that idea, then. The Waze iPhone app certainly covers the UK. I've not used it much to get a feel for the detail or accuracy, but it certainly has all the roads around here (rural Suffolk). The problem with Waze is the contributors. Routes are recorded, but not edited. The amount of times Waze has tried to route me on a private road, layby or industrial estate is beyond a joke. It is simply too much hassle for people to edit once they've got home. So they dont. The amount of corrections I have had to make eventually gets to the point when I uninstall, and vow never again. If you want a reliable, accurate(ish) and free solution. Google is the only real option. Routes are recorded, but not edited. Waze has editors who are responsible for their own local areas and can approve and enter corrections. That's always going to be the problem with user-provided mapping. Open Street Map has a huge head start over Waze and it's far from perfect still. I imagine that most people who are really interested in helping to map their area accurately will be updating OSM rather than Waze. I like Waze, but unfortunately it's not comprehensive enough in its coverage for me to actually trust it to navigate for me. I'm also old-fashioned enough (or have had sufficient issues with network connectivity) that I like to keep my maps locally on my device - whether it's my TomTom PND or Route 66 or Sygic or NDrive on my Android phone. I have ditched my Tom Tom and only use Waze on my iPhone now. It's not perfect - but then neither was Tom Tom. I travel all over the Uk and it's pretty accurate. It will get even better with time. My Tom Tom map was out of date and I wanted to go to an iPhone solution - Tom Tom for iPhone was around �50 - Waze was free - no brainer really! I'm glad to see PGPSW have been giving Waze more coverage recently. I think Tom Tom's recent press release regarding open source mapping was aimed at Waze as well as Openstreetmap. Waze are a real threat now. Waze's business plan (selling their traffic data to third parties, such as local TV news in the US) prevented them from using the pre-existing OSM mapping. When I started using it last year, most of my area was a blank map, but adding the routes I use everyday wasn't much of a chore, it was a similar process to editing the OSM maps, and it's got simpler over time. Then last summer Waze purchased a basemap of the UK, which was merged with the mapping the users had already generated, and now I'd estimate that 90% of roads are mapped. The first few months after that merge was a bit of a mess, but the map has now evolved to a point where I've not had to resort to using my TomTom as a backup since last year. Door to door navigation probably doesn't match the big brands yet, but a full postcode usually gets me close enough. Speed Camera alerts don't work very well, but Cameralert running underneath runs like a dream. POI searching doesn't just rely on the Waze mapping either. When you enter a search it polls Google, Bing and Foursquare amongst others, it's never failed to get me to where I needed to get to yet! Relying on a data connection can be problematic if you happen to be driving though an area without 3G coverage, if you stick to the route it's fine, but if you go off route it cannot re-route until it gets a data connection again, so there is room for improvement there, but it's by no means a data hog. Today's commute (42 mile round trip) used 4MB of data, if I wasn't beta testing their TTS engine it would have been lower (the TTS voice directions are generated on their server and streamed to your phone). The non-TTS voices are pretty nice sounding though. Well, it all depends on the number of users. i used Waze for the first time in Israel, You drive around there in the areas of Tel Aviv and Jerusalem and you notice loads of other users around you on the map. Everybody uses it and keep the data up to date and it is extremely accurate. My brother lives there and uses it daily, it never fails him so he says. In london when I drive around North West London I hardly see any users at all and that is the problem. Over time, when more people start using it it will get more and more accurate, it is in our hands to make it work. Correct, sometimes it shows me incorrect routes but he, you still have to use your head as well with any of the GPS devices you use, otherwise you end up in Manchester when you want to drive to Brighton :-). It was the advantage of iGo I used before that (which at the time I got for free off the internet as well) I could see the overal map of the route and that is something I miss in Waze. I like to see the total route to make sure I am happy before starting to drive.